Scientists Demonstrate Leaner System For Quantum Encryption : The Two-Way Writing in Nature, a team of scientists say they've figured out how to reduce the infrastructure needed for such a system. 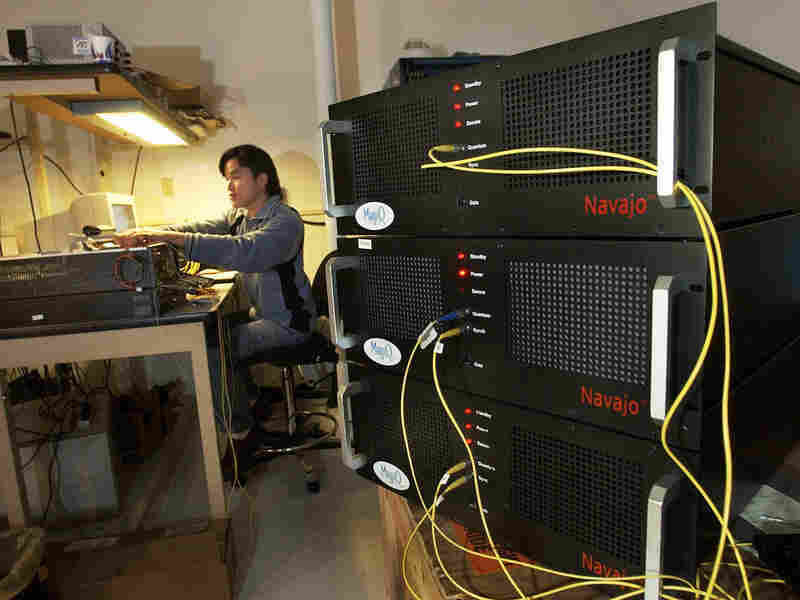 Navajo encryption boxes seen at right in 2003 employ principles of quantum physics. The latest research has shown the ability to run larger networks with less such hardware. Scientists have demonstrated the ability to scale-up an 'uncrackable' computer encryption system that utilizes quantum physics to ensure security. The technique is based on information that is carried by photons, the basic particles of light. While it's been demonstrated on a small scale, the team headed by Andrew Shields and publishing in Nature says they've shown that up to 64 users can share a single photon detector, eliminating the need for each one to have such an (expensive) device. It's part of a burgeoning technology known as Quantum Key Distribution, or QKD, that works off the principle that a quantum system cannot be observed without being disrupted — thus revealing that encrypted information has been compromised. "Due to fundamental principles of quantum mechanics, an eavesdropper trying to learn the secret key would inevitably change it, thereby alerting the communicating parties about the intrusion. In this case, the key would be discarded." In the Nature abstract, the team writes that the "point-to-point architecture removes one of the main obstacles restricting the widespread application of QKD. It presents a viable method for realizing multi-user QKD networks with efficient use of resources, and brings QKD closer to becoming a widespread technology." "If it sounds like a mundane advance, as far as today's quantum cryptography (or Quantum key distribution) technology is concerned it is anything but. Conventional optical networks are highly efficient because they work on the principle of a shared infrastructure that can handle numerous data streams and many users at once without complication. To date, QKD systems have had to set up a single point-to-point link for every connection, requiring duplicate photon detectors for every user wanting to receive a message."